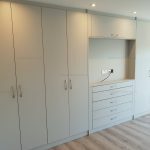 Here is one of our recent projects – a set of modern custom made fitted wardrobe made of high-quality matt white MDF. 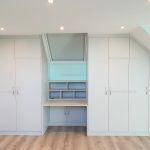 The project included the made-to-measure loft closet with small study area and hinged door wardrobe. 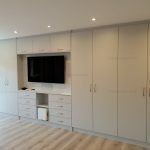 We also made a large fitted bedroom wardrobe with TV niche and hinged door closet as well as chest of drawers and a similar smaller unit for the guest bedroom. The great thing about having a custom made wardrobe is that you can create your own design, choose colours and structures of the material. The same as with a property when you buy one, this is an investment that should serve you for many years and should meet your taste, needs and the vibe of the home. It is our passion to make our customer’s ideas into reality. Apart from the majority of furniture companies of the market we do not limit you with a particular range or a few handles to choose from. We offer you a full list of accessories from our renowned partner to make sure you get truly bespoke fitted wardrobe.